Yes, “Here Comes Temptation” is Toyota’s warning when it comes to their newly redesigned 2018 Toyota Camry, and we’re going to tell you why. Toyota could be talking about the appearance package that they wrapped around the new Camry. No more boring Camrys. Toyota’s CEO, Akio Toyoda, demanded that the new Camry be much more adventurous, and this new Camry is just that. It is a total transformation of the sedan you know and love. It has been redesigned to incorporate performance driving into your daily commute. That could tempt you to take the long way home from work. Toyota started by changing the body to make it lower and wider, and that gives you curve-hugging drivability on winding roads along with stability under normal driving conditions. The 2018 Camry is built on Toyota’s TNGA (Toyota New Global Architecture) modular platform, which allows them to build cars more efficiently while increasing the stiffness in the chassis and lowering the centre of gravity. This offers better handling, as well as lower cowls that give drivers better outward vision. As you can see, the TNGA platform helped to redesign the Camry and up its dynamics. Be prepared to be tempted to try the Camry out on your favourite twisted road. The front end of the 2018 Toyota Camry has a sharp nose and squinty eyes. While the front end itself is not pointed, the layout of the grille and the arrow shaped fascia certainly give the car a hawk-like beak. While sleek from nose to tail, the bumpers are filled with intense lines and angles that give the Camry its new aggressive appearance. Just because the body is now lower does not mean that you lose headroom. In fact, Toyota dropped all of the interior components an equal distance to keep the headroom. The wheelbase has been increased so that legroom might benefit from the increase in space. Toyota replaced the rear strut suspension of the previous seven generations of Camrys and added a double-wishbone suspension. The removal of the rear struts frees up some back seat and trunk space. The new suspension system gives the Camry a superb ride and improved steering. 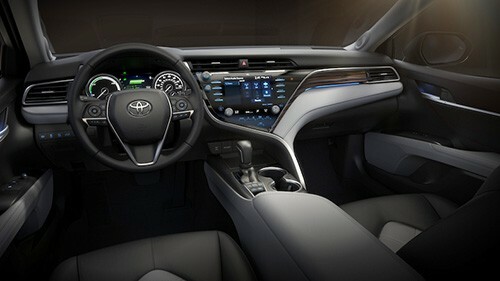 Toyota also added new sound-dampening materials that reduce the noise in the cabin. The 2018 Camry comes with your choice of a 2.5-litre 4-cylinder or a 3.5-litre V6 combined with an eight-speed automatic transmission. This is the first time that the Camry has been equipped with an eight-speed transmission. The Camry also comes in a hybrid model that is equipped with a 2.5-litre 4-cylinder and the Toyota Hybrid System consisting of two electric motors. 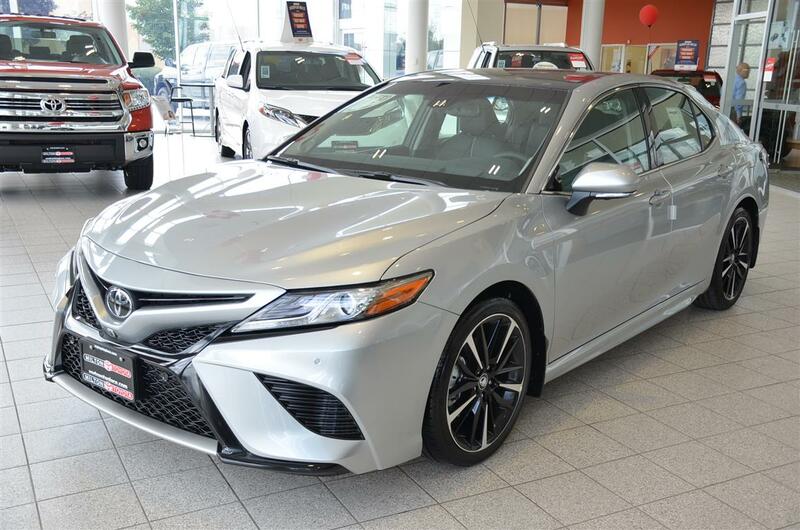 You can get the 2018 Toyota Camry in a number of trim levels, and like all Toyotas, each trim level is an upgrade of the previous level’s equipment and performance. The Camry comes with all the standard safety equipment, like ten air bags and the Toyota Safety Sense P package that includes a pre-collision system with vehicle and pedestrian detection, in-vehicle camera, lane departure, dynamic radar cruise control and automatic high beams. An available Entune™3.0 Toyota Connected Services lets you connect all of your devices for a more personalised driving experience. Everything is new in the 2018 Toyota Camry, and it is waiting for you to experience. Stop by and test drive one today.